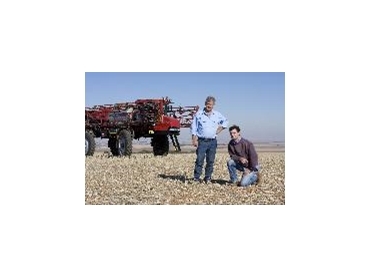 With the cost of chemicals having doubled over the past two years, contractors and farmers are moving to systems such as Case IH’s AIM Command, which delivers precise and efficient chemical application in a range of field conditions and at speeds of up to 40km per hour. AIM Command, which is ideal to the Case IH range of Patriot sprayers, allows operators to specify droplet size and pressure from the cab, regardless of water rate or ground speed. “With other systems, when you slow down for obstacles, you lose pressure and hence your application and chemical use isn’t as even across the field as it should be,” explained John Shadbolt, who runs a 12,000-hectare mixed cropping operation at Nungarin, near Mukinbudin in Western Australia. For contractor Rob Boschen, one among the significant benefits of AIM Command is its ability to deliver results. “We contract spray between Hamilton in Victoria and Hay in New South Wales and in our game, you have to make sure you provide a good service if you want follow-up work next season. The risk of spray drift is also reduced using AIM Command. “We spray within metres of vineyards in the Clare Valley, South Australia so minimising spray drift is one of our principal concerns,” explained David Maitland, who with his son, Jim, runs a 3,000-hectare mixed cropping operation spread within a 30 km radius of Clare. Customers who place an order before 30 June 2008 can save up to $18,500 on AIM Command. In addition, all Patriot Sprayers manufactured from July 2008 will be AccuGuide autoguidance-system ready, eliminating the risk of skips and overlaps. Other new features include standard boom height control on Patriot 4420 models enabling control of the distance between boom and crop and a new High Intensity Discharge (HID) lighting package to improve visibility, during the ideal spraying conditions offered by night time operation.